The Official Cristy Lane Website. The #1 Album, Song, Biography . . . Next The Movie! Welcome to the official Cristy Lane website! For more than three decades, Cristy Lane continues to provide beautiful music and a #1 million selling biography, "One Day At A Time," that inspires people around the world. From the battlefields in Vietnam, where Cristy Lane performed more than 120 shows and nearly lost her life, to her recognition by the Veterans of Foreign Wars Hall of Fame, Cristy Lane’s story is just as inspiring today. Here you’ll find the online home of Cristy Lane music, songs, television specials, and the Cristy Lane biography, "One Day at a Time." 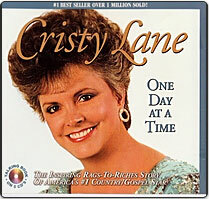 Cristy Lane's #1 Million Selling Biography "One Day at a Time"
plus 10 Favorite Downloadable Songs!